Go to developer.twitter.com/apps and sign in with a Twitter account. 1a. If you have not yet created a Twitter developer account, you will be asked to create one. Click the ‘Apply for a developer account’ button, follow the instructions for creating an account, and then click the link in the verification email you are sent. That brings you to a Welcome page where you can create a new app. 2a. Enter a name and description for your forum. 2b. Enter http://forum.example.com in the Website field obviously, replacing the domain with your site’s actual domain name and matching the correct protocol, HTTP or HTTPS. 2c. Enter http://forum.example.com/auth/twitter/callback in the Callback URL field. 2d. Agree to the legal stuff and click the Create your Twitter application button. In the Permissions tab, choose “Read Only”, and “Request email addresses from users”, then click Update Settings. Click on the Keys And Access Tokens tab. Copy the API key and API secret and paste it in the twitter_consumer_key and twitter_consumer_secret settings in the Login section of your Discourse site (/admin/site_settings/category/login). The above steps also apply if you want to enable “rich embedding” of tweets with pictures and more. If you want rich embeds but don’t need Twitter login, simply uncheck enable twitter logins and leave the consumer key and secret intact. (like me), the solution is to change your e-mail address forth and back again (i.e. confirm it twice). Has anyone found a way to add several callback URLs to the same Twitter app? This is possible with Google and Facebook but I can’t find a way to do it with Twitter! The key thing is that Twitter needs to allow email to come back as part of login, like every other social login provider. Is ticking this on going to be enough or does something need to change in Discourse? Oh nice, can we look into this next week @eviltrout? Thanks for letting us know @brahn. changed 1 files with 13 additions and 1 deletions. Fantastic, confirmed working 100% here on meta. I’ve also updated the first post to reflect the new setup. I have successfully set up twitter logins and it works, but I don’t see how to associate a twitter login to an existing account. I’d like a way in the admin panel of an existing user to associate a twitter/fb login. At the moment it seems that with Discourse 1.6 I can only setup a new user with the twitter login. If emails match the association is automatic. Thanks. I found FB logins match existing user, but twitter wasn’t. Anyways, FB working is enough so thats good. I followed the steps and have double checked myself. When I click on the “test OAuth” button I get a “page does not exist” error message. I am entering https in the website URLs…should that be http? The enable call back locking is NOT checked. Should it be? Actually it works when you leave permission to “Read and Write” and uncheck required email. For me step 9 did not work. But it may work for others. Write is highly not recommended. Ok I’ll change that then tks! Great walkthrough! You might want to add that it is required to check the “enable twitter logins” checkbox. I know it is obvious, but when following the steps one tends to overlook that (at least I did). You might want to add that it is required to check the “enable twitter logins” checkbox. I know it is obvious, but when following the steps one tends to overlook that (at least I did). The software powering this discussion forum encountered an unexpected problem. We apologize for the inconvenience. Detailed information about the error was logged, and an automatic notification generated. We'll take a look at it. No further action is necessary. However, if the error condition persists, you can provide additional detail, including steps to reproduce the error, by posting a discussion topic in the site's feedback category. I’m not sure what’s wrong with the Twitter app but we could use a better error message than that. EDIT: the problem was a case mismatch in the site hostname in the Twitter application, but regardless we could give a nicer error. That seems like a rare case, and probably mishandled by Twitter as well. I’d apply the rule of three here: we need to see this error happen three times on three different sites before we need to do anything about it, otherwise we’re taking action prematurely & speculatively. Note that the “Callback URL” field is now mandatory. If you omitted it in your setup, Twitter login will fail with a 403 unauthorized error. Also note that if you have any extra spaces at the beginning or end of your callback urls, auth will fail. You can find other discussions about this change on the Twitter Community. Just noticed we were getting the same error on our site with Twitter auth. 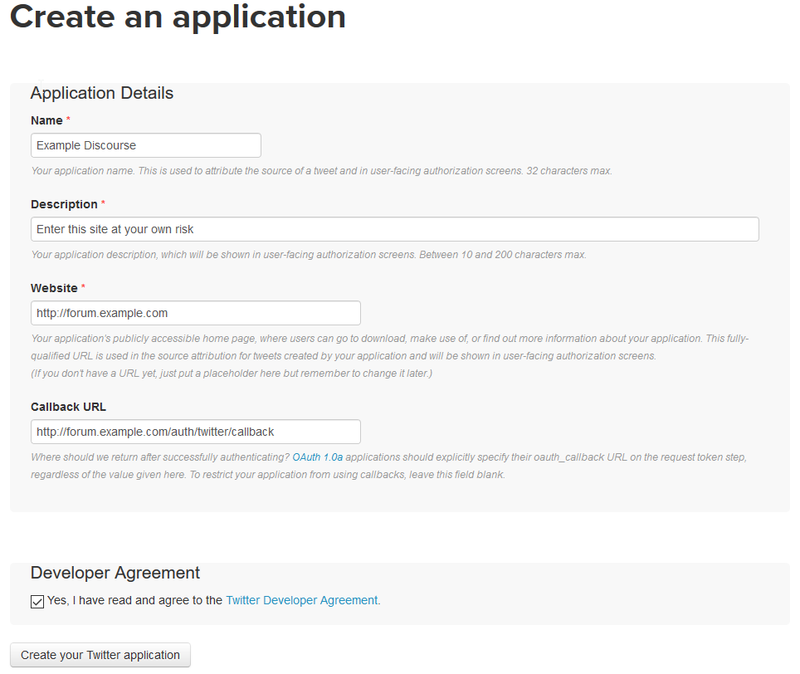 I noticed Twitter has a new process for authorizing developer apps, so we are going through the approval process. Not sure if it is related, or if this problem has just been in place for a long time now.